The Venerable Bede was an outstanding scholar and the first historian of the English Church. His works are the most important source of our knowledge about the beginning of Christianity in England and the lives of the early saints. St. Bede was born in Northumbria in 672 or 673 A.D. Not much is known about his early years. Some ancient documents suggest that the saint came from a noble and well-to-do family. * At age 7, he was entrusted to the care of St. Abbot Benedictt Biscop, the founder of Sts. Peter and Paul monastery in Jarrow. As a child, St. Bede already showed an amazing capacity for learning. His saintly teachers, the monks, nourished the youth’s talents and instructed him in the literature and sciences known at that time. St. Bede studied astronomy, arithmetic, grammar, history, lives of saints and ancient philosophy. He knew Greek, Latin and Hebrew, and could read many works of classical authors in the original language. St. Bede was especially well-versed in the Holy Scriptures. The young scholar was also a pious monk who performed his duties with great zeal. At 19 St. Bede was ordained a deacon, and at age 30 he became a priest. 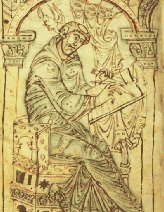 Venerable Bede spent all his life in Jarrow – learning, writing, and copying the holy books. Only once he left the monastery, to teach in the school at York for a few months. During his lifetime, St. Bede became such a respected author in matters of faith that, by decision of a Church council, his writings were publicly read in English churches. His works were widely read throughout Europe. In addition to copying many sacred texts, St. Bede wrote 45 books of his own, including commentaries on the Bible. He also created The Martyrology, a listing of saints. Of all St. Bede’s writings, An Ecclesiastical History of the English People is the best-known. No other work written at that time gives us such a detailed account of the early English Church. The History, which consists of five volumes, starts from the period of Roman Britain and the martyrdom of St. Alban and chronicles the first missionaries to the British Isles, the spread of Christianity through the kingdoms, and the first English saints. Unfortunately, not all the works of St. Bede were preserved to this day. Most of his translations, including the Gospel of St. John, were lost. It is interesting to note that the words that express chronological dating – Anno Domini (A.D., in the year of our Lord) – came into common use thanks to the writings of St. Bede.